Today’s 30 Days 30 Ways challenge is about identifying and connecting with your local emergency manager. EASY – that’s me!! You can find out more about me, or you can connect with London Prepared on twitter. Well, as that was pretty easy I thought I’d try to put an estimate on how bit the emergency planning community is in the UK. It turns out this was quite an ambitious task! The first thing to note is that I had no easy or quick access to any definitive information, so what follows is an estimation based on the size of the following LinkedIn groups and my personal experience. Assuming the same is true across the country as in my own team, 50% aren’t active on LinkedIn, so let’s double the average size (1,094) to give a better estimation (3,143). Acknowledging that emergency planning may not be the primary responsibility for some people, I’ve doubled again (6,286) and then added 10% ‘for luck’ and then rounded to the nearest thousand. That gives a final estimation of 7,000 emergency planners in the UK. Does that sound about right? I’d be interested in thoughts of others in whether this sounds about right, or how a better number could be determined. Whilst 7,000 sounds like a sizeable number, many of those are in the private sector and although extremely knowledgable, couldn’t really be considered your local emergency planner! The best way of finding your local emergency planner is to contact your Local Authority, or your Local Resilience Forum. Update: Following a suggestion from @Rubonist I’ve taken a look at the number of registered users on ResilienceDirect (an online system used local resilience forums in the UK). I’m not sure I have access to the full data, but I’m about 300 shy of the number of registered users. As the system isn’t expensively used by the private sector I’m going to revise my estimate to nearer to 8,500! Update 2: After a question from a colleague @UKResilience – for clarity I’m defining an Emergency Planner as someone who is responsible for and actively involved in developing emergency plans in their organisation. This might not necessarily mean EP is 100% of their role, but equally, I’m not counting the people at senior levels who have a responsibility but don’t actually ‘get their hands dirty’ with the work. Update 3: The Emergency Planning Society (one of the leading Professional Bodies for resilience practitioners in the UK) have released their Annual Report 2013-14. In this document the below breakdown of membership is provided. 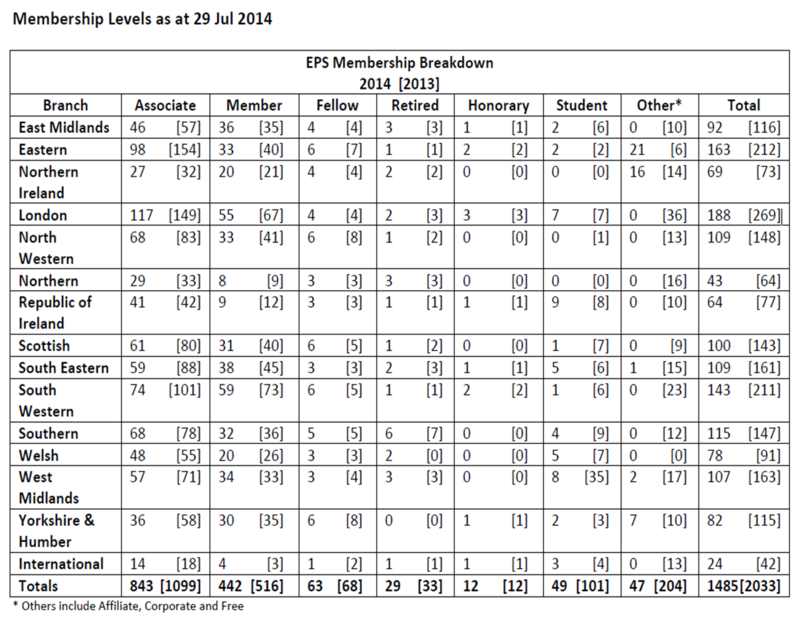 It’s interesting to see that there has been a considerable reduction in the number of members compared to the previous year, but also that there are fewer members compared to the EPS LinkedIn group!